Why does Alopecia Areata (AA) occur? Alopecia Areata, also known as patchy hair loss, is caused by an autoimmune disease. To be specific, T-cells in our body attack hair follicles (it can be just one or multiple spots) and cause hair to fall out in those areas. The research was first conducted by using two different types of JAK inhibitors (ruxolitinib and tofacitinib) on mice. JAK inhibitors are an FDA-approved medication used to inhibit certain protein cells (called Cytokines) from promoting cell growth and immune response in our body. What was the result of the research? The researchers discovered that JAK inhibitors resulted in complete hair restoration in mice within 12 weeks. With those positive results, the researchers then followed with a small group of patients with Alopecia Areata for human clinical trials. 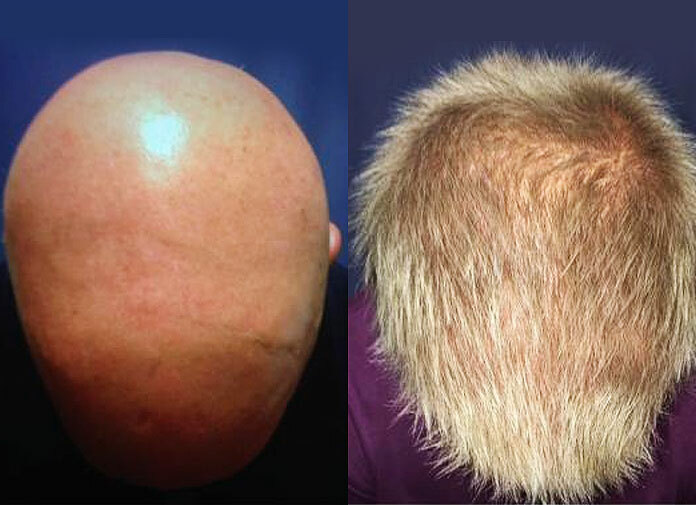 Several number of early patients receiving the medication (ruxolitinib to be specific) started to see their hair grow back in just 4 to 5 months. They also found out that the T-cell attacks (autoimmune activity) were completely stopped. With promising results on both mice and humans, the research team plans to perform more extensive testing of ruxolitinib (type of JAK inhibitors) to ensure its efficacy and safety as a treatment of AA. This is great news for people who suffer from Alopecia Areata, because currently there are only few treatments available to put a stop to this symptom (be sure to read this article covering the research of an arthritis drug to cure Alopecia Totalis, which also resulted in 100% full hair restoration).